Woodborne Design is a company of creative problem solvers. This means we love a challenge. We tackle the challenge of home additions and renovations with the same uncompromising standards of graceful aesthetics and straightforward efficiency that we apply to our new custom house plans. Sometimes we face the challenge of home additions and renovations by aiming to seamlessly integrating new space and materials into old existing structures. Other projects call for a total reconception of existing structures by way of additions and renovations that transform old buildings into something completely new. Then, there are times when home additions and renovations need to negotiate a middle path between blending in and distinguishing themselves as new and different. Additions and renovations like this can proudly show off their identities as �new kids on the block� provided they don�t detract from the merits of the �old-timers� to which they�re adjoined. At Woodborne Design, we�ll help you choose the right path for your project, and together we�ll breathe new life into the structure you have in mind for an addition or renovation. 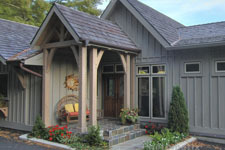 Whether it�s a main level master suite for your home in the High Country mountains of western North Carolina, a full-scale renovation to your lake home in north Georgia or a new garage for your coastal residence in eastern South Carolina, we can help put you on the path to a new custom kitchen, an in-law suite, or a fresh new facade for your beloved family home. 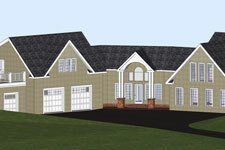 We can help you envision your home addition or renovation with our 3D CAD program. This state-of-the-art program creates realistic perspective views of the home transformation you have in mind. By allowing you to see what potential changes to your home could look like, this powerful tool can help you decide on a specific design direction long before any construction begins. 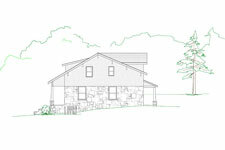 We can model forms, colors, and textured finishes to help you visualize the end result of any addition or renovation. The ability to visualize & explore the infinite possibilities of home additions and renovations during the design phase of your project can save you money in the long run by helping avoid costly construction changes. Please take a few minutes to review some or our custom designs for home additions and renovations. We hope you like what you see and we�ll be looking forward to helping you creatively transform your home.